The cast was led by Western movie veteran Ward Bond playing Wagonmaster Major Seth Adams. Robert Horton played the dashing scout, Flint McCullough. Former stuntmen Terry Wilson, as Bill Hawks and Frank McGrath as Charlie Wooster rounded out the Wagon Train’s staff in the early years. 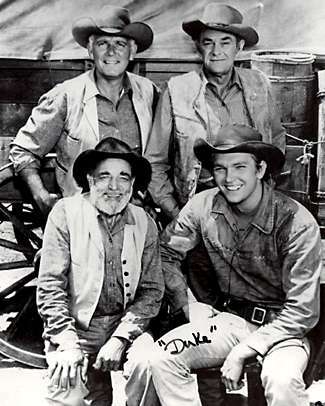 Denny Miller joined the train later as Duke Shannon. Much was made in the early years over a conflict between Bond and Horton. Perhaps it was inevitable that the elder Bond who had been playing cowboys for years would have differences with the younger, professionally trained actor who was quickly stealing the show. But all of this is nothing more than an historical footnote as far as the viewer is concerned. Onscreen their chemistry worked very well. Sadly, Ward Bond died on November 5, 1960. John McIntire assumed the job of Wagonmaster as Christopher Hale. Fresh off his success as Jess Harper in Laramie, Robert Fuller took on the job of scout for the train. “Coop” is what they called him, for Cooper Smith. After five seasons of surveying the trail ahead, Robert Horton left the show to pursue a successful career in the musical theatre. He left the stage briefly in 1965 to be the sole star of TV’s A Man Called Shenandoah. Heading across the trail to look for his father, young Barnaby West, played by Michael Burns, joined the cast in late 1963. Howard Christie produced the show for Revue Studios (the TV production arm of Universal Studios) and Wagon Train survived many changes over those eight years. In 1963 for one season they tried taking the show to an hour and a half format and filming it in color. This was to compete with the Virginian (also from Revue). But that proved unsuccessful and the following, final year the show returned to the original one hour length. And worse, they returned to shooting in black and white which drove viewers away. Apparently, the studio was literally banking on the Virginian. 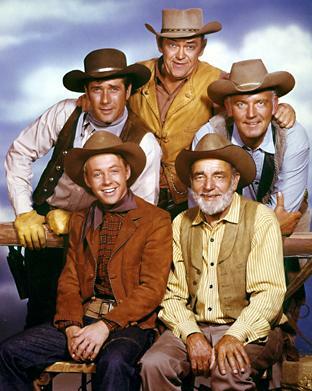 Wagon Train switched networks in 1962 and although reports of the sums for this vary, ABC paid huge amounts to bring the show under their umbrella. Here is the Wagon Train schedule. 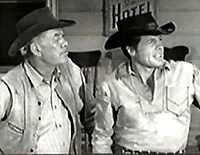 On the pages of this site you will find episode guides, info on the stars and their careers, screensavers, games, video and audio clips plus some great pics of Robert Horton and Robert Fuller as a bonus for their many fans. Enjoy!